Give the gift of Powerful Positive Change to a loved one, friend or colleague. Sometimes, all it takes is a little nudge to jump-start someone’s transformation journey. Gift Certificates are a unique, personal and thoughtful gift to help get the process started. Gift Certificates are elegantly printed and personally designed making your gift something special. Gift Certificates are NOW available in $25 increments. 1. CLICK HERE TO ADD A GIFT CERTIFICATE TO YOUR CART. 2. Add the number of increments to reach your desired amount. 3. Proceed to Check-Out. Enter your information. 3. In the “Additional Information” section, enter the first and last name of the Recipient and any other information you want to provide about the purpose of the Gift Certificate. 5. You will receive the Gift Certificate via email within 24 hours. You email to the Recipient or print and hand deliver. 6. Upon request, Gift Certificates may be printed and mailed directly to the Recipient. Please indicate this preference in the “Additional Information” section during the check-out process and provide the Recipient’s full name and mailing address. Please allow 2 business days to process this request. You will receive email confirmation when the Gift Certificate is mailed. Recipient may redeem the Gift Certificate in whole or part by booking through the online calendar. In many cases, a consult prior to session may be necessary and in some cases a doctor’s referral may be required. Recipients may redeem the Gift Certificate for in-office or phone / skype sessions. 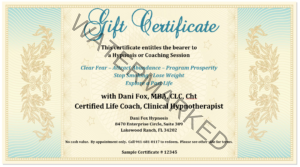 Gift Certificates may also be used to offset the cost of a multi session package such as smoking cessation, weight loss, pregnancy and coaching. Recipients will be expected to pay the balance due in the first session. Gift Certificates are not redeemable for recordings in the webstore. Gift Certificates are not refundable; however the credit will remain in the Purchaser’s account until the Recipient redeems the certificate. If the Recipient is not interested in redeeming the credit, the name will be voiced and the Purchaser may apply the credit to their own session or that of an immediate family member.